The cholesterol transporting lipid system would prove to be agile – much more so than is typically believed (this appears to be accurate). Discrete patterns should emerge between the diet and serum cholesterol now that disruptive inflammation is lower (this certainly appeared to be the case). Thus, when we refer to LDL-C and HDL-C, the “-C” refers to the amount of total cholesterol when added together (the cargo of all ships combined). But when using LDL-P and HDL-P, the “-P” refers to the total particles (a total count of all the boats that carry the cargo). The current belief in Lipidology is that LDL-P is a good, independent marker for cardiovascular disease. But within the low carb community, many believe there needs to be a distinction between “large, fluffy” LDL-P and “small, dense” LDL-P. They would argue that the small, dense particles are the true cause for heart disease, whereas the large, fluffy particles are benign or even protective. I won’t go much further into this debate other than to say I’ve read a lot of the studies each side prefers, and I’m not fully convinced of either position at this time. Back when I had eight tests over three months, the LDL-P appeared to match the LDL-C and its inverted correlation to the three day average of total fat. 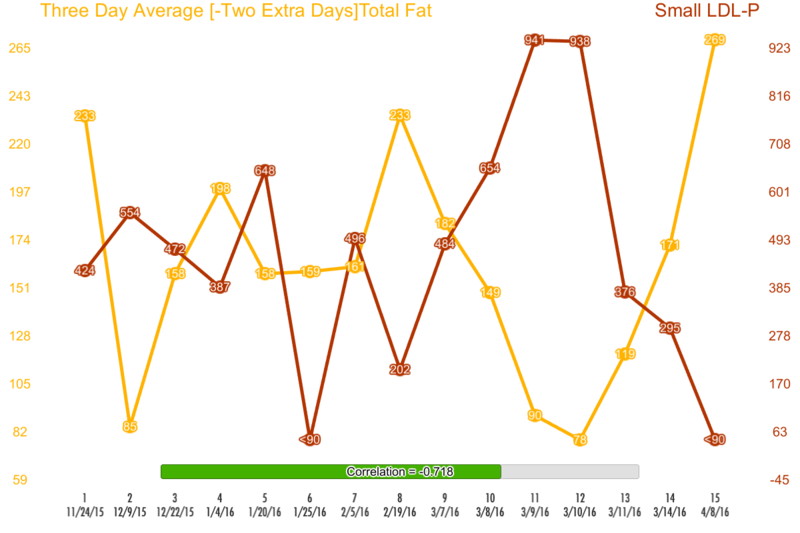 So LDL-P correlates with the three day average of dietary fat just like LDL-C, right? Not so fast. Here’s what happened during the week-long experiment. Obviously, this graph seems to suggest that a two day delay is occurring. But could it really be that simple? 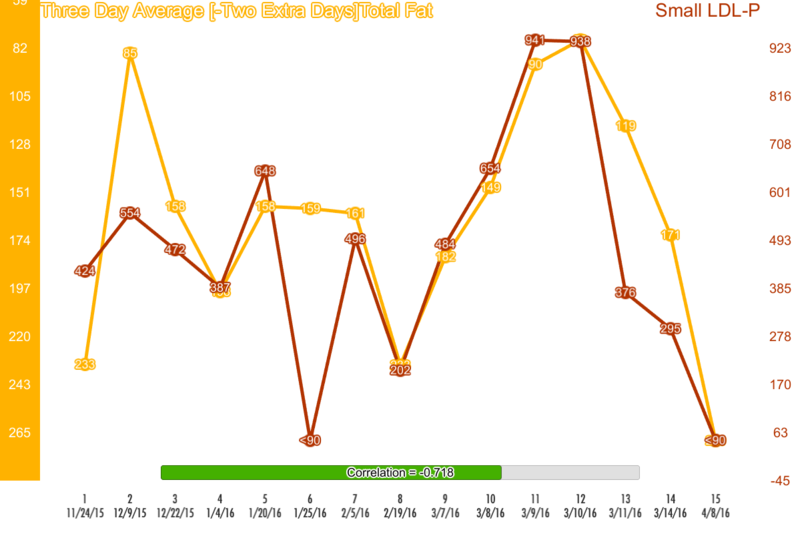 We’ll get to that in a second… but for now, take extra notice of the massive swing in my LDL-P over just eight days! On Monday’s blood test, I’m coming in at 2622. Two days later I have the highest score I’ve ever gotten at 3391! Then, just two days after that, I’m landing over 900 points down at 2455. I’ve read article after article that suggested this system takes extensive time to change. And while that might be true of 1/2 to 2/3 of the baseline score, it certainly doesn’t seem to pertain to the rest. 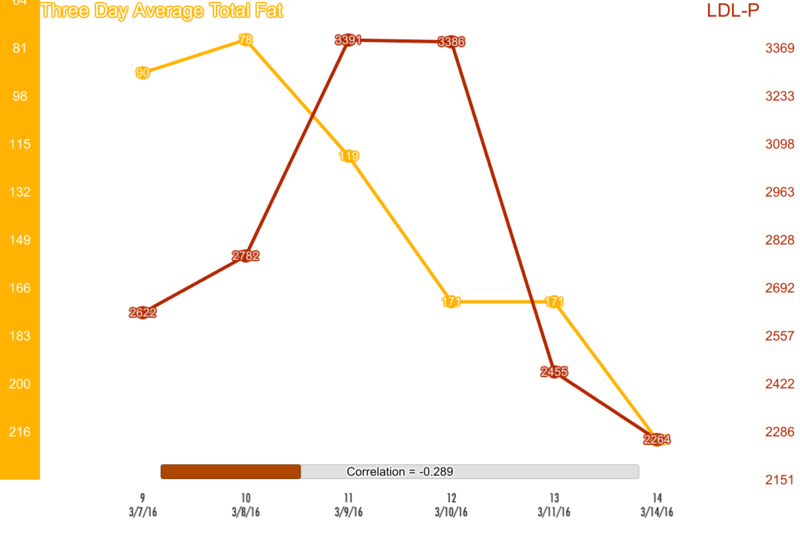 I set up a new formula against my spreadsheet to see if I could capture the correlation. To use the example from before for LDL-C, if I took a blood test on a Friday morning (Day 0), the relevant numbers appeared to be the average of Tuesday, Wednesday, and Thursday together (Day -3, Day -2, and Day -1). 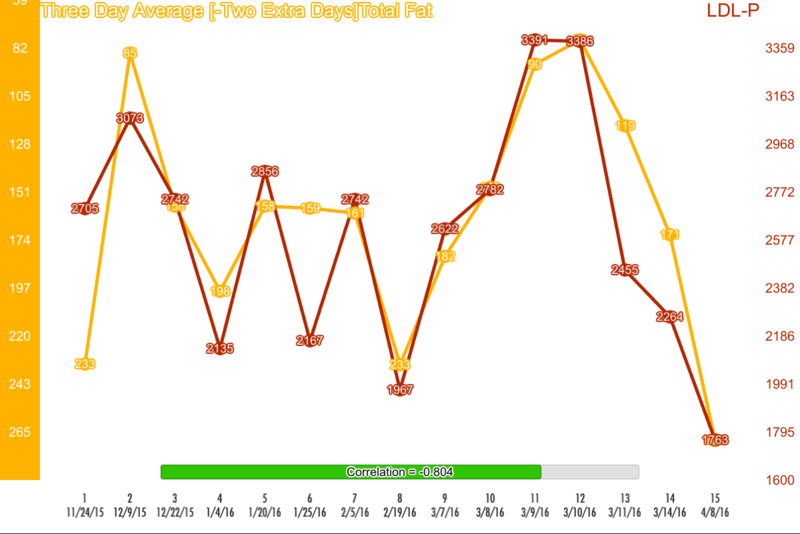 In the LDL-P equation, however, I’d still average three days, but with a gap of two days in between. So if the test were on a Friday morning (Day 0), I’d average together Sunday, Monday, and Tuesday (Day -5, Day -4, and Day -3). Below, I put together the 1-8 tests over three months, the week-long 9-14 tests, and the outlier test together using this equation. Naturally, this is where my jaw hit the floor. This obviously brings up a lot of powerful new questions regarding LDL-P synthesis of the liver in this counter-regulatory role. But this post is for the lay person, so I promise not to geek out on my lipid theories here. That will come in a later post. What of the “small, dense” LDL-P mentioned above? Do they, likewise, track with the new formula? Once again, we have massive shifts in a very short span of time with the week-long experiment. I go from a 484 to a 941 in two days, back down to a 378 two days later, and finally to <90 after a weekend of eating high fat three days straight. And also once again, I practically custom-set a <90 on the intentional outlier at the end by eating massive amounts of fat. 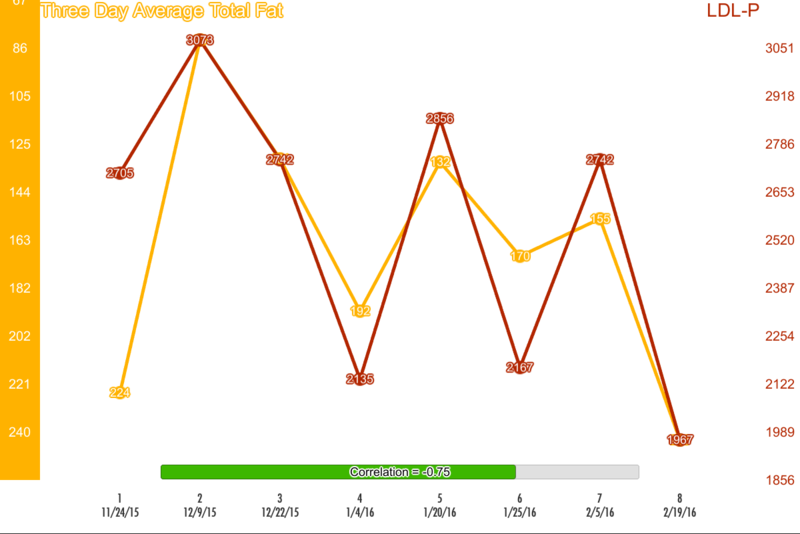 My smLDL-P tracks very closely with my LDL-P, yet its ratio of gain-to-loss is much higher. LDL-P and small LDL-P appeared to have a correlation with a three day average of dietary fat as like LDL-C, but with a key exception of adding a two day gap between the dietary period and the blood test. Small LDL-P appeared to correlate closely with LDL-P, but at a higher gain to loss ratio. Both LDL-P and small LDL-P proved to be extremely agile and easily ramped up or cleared when observing via daily blood tests (data points 9-14). In fact, shifts in the hundreds of particles per day were easily achieved in either direction. After having enough of this data in hand, I then realized there was still a problem with proportionality of the other macronutrients. If I was good at holding to a ketogenic ratio throughout this period – 75% fat / 20% protein / 5% carbs – then, technically, one could argue it is actually possible that protein or even carbs are driving the cholesterol correlation. After all, even at a lower volume than fat, they were still proportionally going up and down roughly the same amount, right? 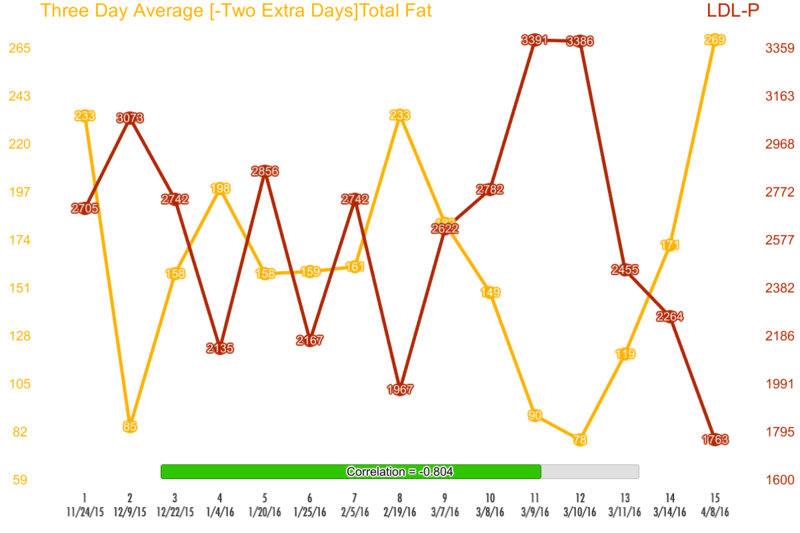 Coming up in Part III – The Divergence… Would testing different ratios of macronutrients change the results? Hi Dave, another interesting post. With regards to timing this has got to be related to LDL cholesterol residence times, remember this is 2 days for LDL I/II and 5 days for LDL III/IV, its too much of a coincidence otherwise. I am also thinking there has got to be an interaction between chylomicrons and LDL or some intermediary regarding cholesterol. Chylomicrons carry cholesterol from the digestive tract to the liver but from what I have seen there is no direct interaction of the two species. However your results would indicate when chylomicron numbers get huge there HAS to be some interaction as one goes way up at exactly the same time that the other goes down. For instance if there is not enough dietary cholesterol then chylomicrons would need to get it somewhere else or traffic less to the liver. I suppose either is possible but I bet they are interacting with one or more of the cholesterol carriers to obtain it. In short, I don’t need to know the exact process that generates this pattern, I just want to isolate it first and determine if it is predictable (appears to be, so far) and biologically intended (too early to say). I’ll get into this more on my theory post. Over the years of enduring my doctor’s siren songs to go on a statin, eat less (or no) meat, eat leaner stuff etc., I have discovered my own way to shut her up (besides my NMR’s): EAT ALL THE FAT! By that, I mean don’t focus on just one type or chain length of fat–mix them. I’ve begun mixing several different kinds/chain lengths of fat into “fat bombs” for cooking–equal amounts of melted coconut oil, butter, and lard (or bacon grease), mixed with equal amounts of EVOO, MCT oil, and avocado oil–all combined and frozen, then cut up into butter-pat-sized squares to use while cooking. Just throw one or two out of the freezer into the pot or pan, and carry on cooking. I also use the same combo of fats listed above for salad dressings–add about half the amount of vinegar and some spices, shake, ans set aside (covered) at room temp. DO NOT FREEZE! At my last NMR, my HDL rose from the 70’s to 99, my LDL dropped from 139 to 122 (like I care), total cholesterol stayed the same, but my small, dense LDL is now firmly in the Pattern A zone (as opposed to just barely being in Pat A). Now my doctor has nothing real or imagined to complain about as far as my cholesterol goes, and I can still carry on eating HFLC. I’m certainly no fan of statins. Much of my cholesterol research naturally bounces me against many of these statin studies. Unfortunately, it’s where much of the money to study heart disease comes from and thus many general theories on lipids emerge in the context of these drugs and often in very short time spans. To date, all the large scale, recent studies I’ve seen (See Japan and Norway, for example) show an inverted relationship between higher cholesterol and higher all cause mortality for women. I am enjoying your posts tremendously! Thank you for sharing and looking forward to the follow-ups. Thank you, Therese. There’s quite a bit more to come! Maybe, certainly looking forward to your next post. I’ll have Part III out this coming week, and possibly one more of my data breakdown. As your data shows, LDLc positively correlates with LDLp – the more LDLc you have the more LDLp you will need to transport it. Particle size might vary from person to person but regardless, if LDLc goes up so will total small LDLp. By now we know LDLc isn’t worrisome in and of itself. So given how LDLc & LDLp positively correlate, I don’t put much stock in the LDLp Gradient Hypothesis of atherosclerosis – to me it is just a re-branded version of the ‘LDLc = bad for atherosclerosis’. As my data goes, the higher my TC (and also my LDLc) the better my trigs-to-HDLc ratio is – currently at 1, sometimes <1. Thankfully my OGTT with insulin assay seems good, but possibly confounded by physiological IR due to me being on a long-term (mostly) ketogenic (but often) LCHF diet. Looking forward to post III ! To be fair, I don’t know for sure if the mechanism that is moving my LDL-C and LDL-P will translate to everyone else. But I suspect in a low inflammation, ketogenic diet it will. My theory is that either sugar or inflammation or both are confounders for observing the pattern of dietary fat to serum cholesterol regulation. I too have a better Trig/HDL ratio since going on the diet and I do understand why that is likely relevant for CVD. But also to be fair, the more I’ve been digging into studies and learning their core methodology and flaws, the less I trust the vast majority of them (pro or anti low carb). At some point soon I’ll post my personal ratings system for studies and how I’ve built a risk model against it. But the spoiler alert is that it has me currently cautiously optimistic that I’m on the right track with both my diet and cholesterol (or at least, that it will be a net gain in lower risk for All Cause Mortality). But this is always subject to change. One thing that maybe will explain your readings. If the bulk of the cholesterol is coming out rather than going in or being produced internally a high dietary FFA flux would not require liberation of stored lipid hence cholesterol from adipose or ectopic fat since sufficient triglycerides would be available from digestion. According to Phinney saturated fat is used first so I suspect a high sat fat meal may not require the body to liberate much from internal stores, whereas a low fat meal possibly would if the person was fat adapted, particularly if the meal was calorie restricted as well as being lower fat. Such a thing is well known during weight loss where a bounce in cholesterol can often be seen. Volek/Phinney in their book “The Art and Science of Carbohydrate Living” remark that this is often seen at about 40 lbs loss. William Davis also advises people to wait six months to get tested again for the same reason. What seems to happen is the stored cholesterol cannot be retained at a certain point in the remodelling of the fat cell and therefore comes into plasma. Since the body stores fat virtually anywhere this means it is storing cholesterol virtually everywhere. If insulin drops to fasting levels cholesterol production drops dramatically as ketone production gets turned on, so if catabolic rates remain steady or decline less than production then the LDL pool will shrink. This is more likely to happen at low triglyceride levels where LDL catabolic rates are higher. So it is possible to see a high fat intake occurring alongside a lower LDL level and vice versa if conditions are right. I am not saying this will necessary apply to everyone, but in your case it just might be. Interesting idea — but I’m not sure I follow the process as you describe. You’re suggesting a mechanism that ultimately involves storage input/output via adipocytes (with regard to Volek/Phinney). 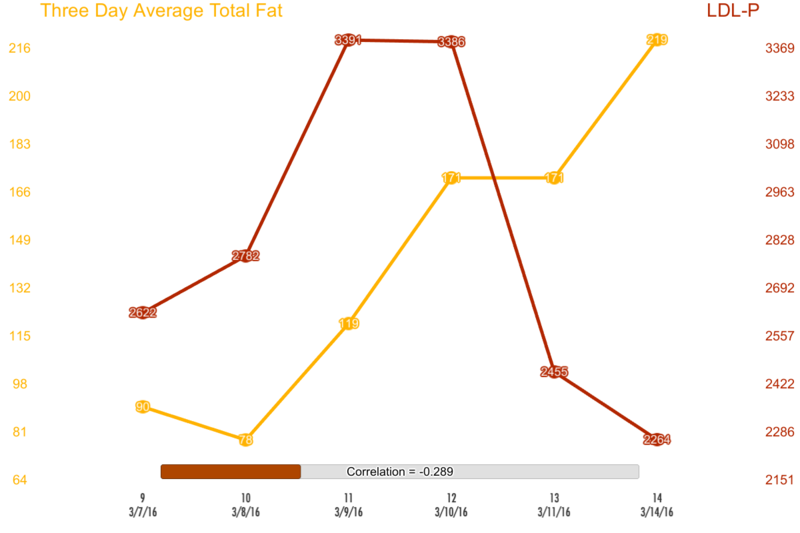 But to whatever degree it is/isn’t in play, it doesn’t appear to have a meaningful impact on this data set as it stands, given the tight correlation with three day dietary fat intake (so far). You may want to to wait for Part III to comment on this further (coming this week). I also mentioned what I was eating during that period, but I have a question about protein. 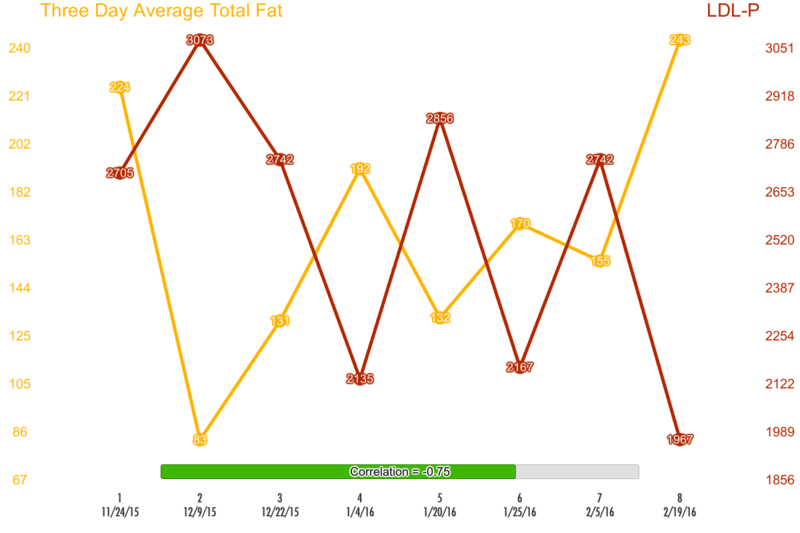 Even though I said I was doing (LCHF), I think I did more of a high protein than pure LCHF. If I put it into percentages it would look like this; 10% carbs, 45% protein and 35-45% fat. Can it be protein that pushes my LDL-P size to I/B? I’m not sure how much 45% dietary protein would impact LDL-P size. Myself, I’m hovering a ratio of about 77% fat / 20% protein / 3% carbs with total calories at apx 2600 for the last couple months.